Travel Tip: Stutsman County Autumn! 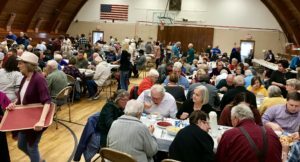 Each October the Streeter Lions and American Legion (and Auxiliary) host a massive buffalo supper in the Memorial Hall of this tiny town just south of Interstate 94 in Stutsman County. Ticket sales are announced a few weeks ahead, and anyone can send in a check and receive their ticket by mail, or even buy one in person from various volunteers. While Streeter may only have a few dozen residents throughout the year, the Buffalo Supper event typically draws many times that number of guests who come from around the state, and even from across the nation, to reunite with friends and family and enjoy an all-you-can eat feast of bison roast and other traditional foods in an atmosphere of warmth and community. 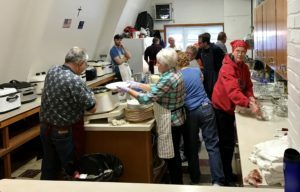 The guests are seated in waves and are served by volunteers, some of whom will have been working for days to prepare the feast and set things up for the crowds who come together to enjoy this wonderful tradition in one of Stutsman County’s otherwise less-noticed towns. 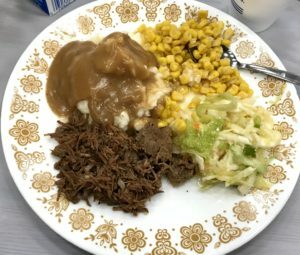 And the meal is truly a feast, with soup and dinner rolls to begin, wonderful local cole slaw, and of course, the main course of bison roast with mashed potatoes and vegetables! 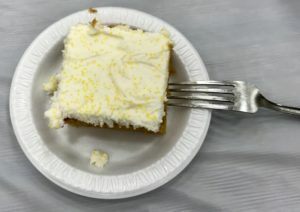 This year I especially enjoyed the delightful pumpkin cake served as dessert! 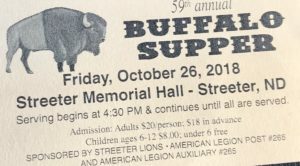 If you want to attend, the Buffalo Supper will take place at the Streeter Memorial Hall on N. Florence Street. Take Interstate 94 west from Jamestown and then exit 228 in rural Stutsman County. Follow 53rd Ave. 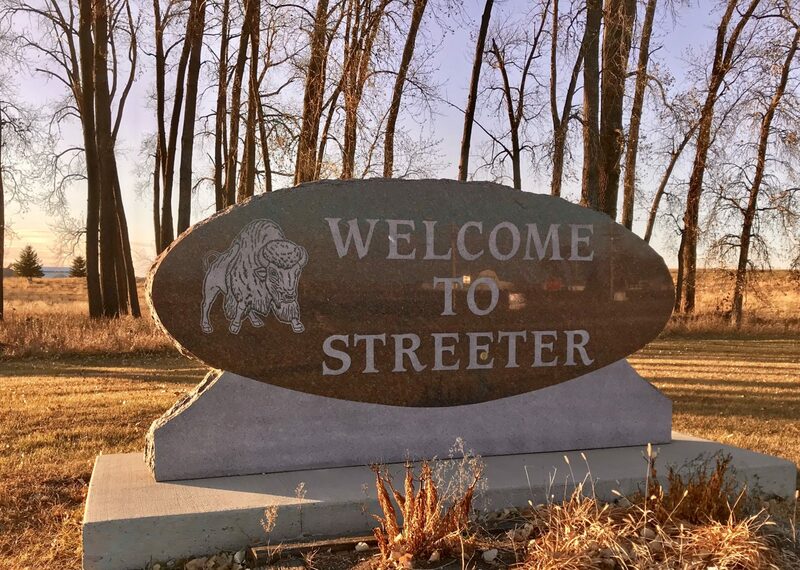 SE towards Streeter, and then turn right onto 52nd St. SE. You’ll intersect with Florence St., and the Memorial Hall will be visible on the right. 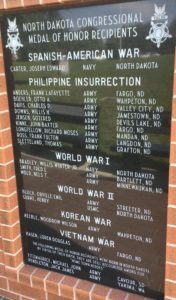 North Dakotans are serious about caring for and honoring their veterans, and Stutsman County demonstrates this with the Veterans Memorial atop a hill overlooking the city of Jamestown on the grounds of the former Ft. Seward. 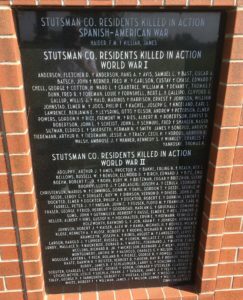 At the Stutsman County Veterans Memorial, you’ll find listings of county residents who perished in past conflicts, as well as those recognized with honors for their service and those who suffered through captivity in foreign lands. Veterans Day is a major event in Stutsman County, and in 2018 the county marked the 100th anniversary of the end of World War I by ringing bells throughout the city of Jamestown at 11am, the very moment of the signing of the Armistice one century ago. 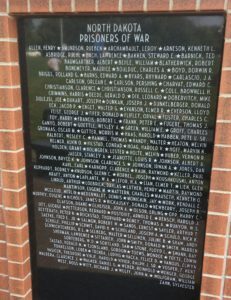 In various events around the county, the names of veterans who served in that great conflict were read out, while in others our living veterans were honored with celebrations, recognitions, and other special acknowledgements from community members and businesses. 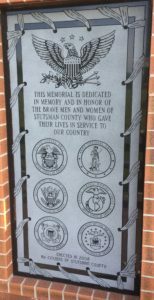 If you want to visit the Stutsman County Veterans Memorial, it is located at 605 10th Ave. NW on the grounds of the former Ft. Seward in Jamestown. The memorial can be visited any time without admission. Autumn in Stutsman County is a time of changing season, family gatherings, and traditional celebrations which are sure to brighten the heart and bring a smile to any traveler’s face. 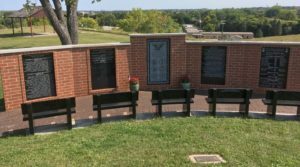 If you find yourself in the region this fall, be sure to take in the Buffalo Supper and Veterans Memorial–you’lll be glad you did! ← Independence And The Journey West! It looks like it’s already getting cold… stay warm!